After getting pregnant, you’re left with a giant list of dos and don’ts from your mom, your friends, your great aunt, Google — you name it. But how much of what you’re being told is actually true? There’s the Great Cheese Debate, trying to decide whether your cat needs a new home, and even figuring out whether or not you need to cancel your hair coloring appointment. Not to fret: we’re addressing the rumors once and for all. 1. No, mothers aren’t eating for two. 2. You don’t need to cut cheese out of your diet. If you want to keep seafood in your diet, don’t let being pregnant stop you. But if the majority of your seafood intake comes from mercury-rich sources, that’s when you should watch out. A lot of mothers are afraid to dye their hair while pregnant, but Gottlieb says not to worry: There’s nothing wrong with keeping up with your hair appointments. “If you’re nauseous in the first trimester, it’s not great to be at a salon with all those fumes because that might make your nausea increase. But your hair follicles are already dead, so you’re dying something that’s not living — it’s only at the tip that’s alive. So it’s fine to dye your hair, and most of products used are non-toxic anyway,” she says. 6. You can get your varicose veins treated, but there’s a catch. When it comes to treating varicose veins, Gottlieb says there’s no harm in doing so before you’re done having kids. But if you want to save money, you might want to wait. “They can get them treated, but they’re going to have more pop up. 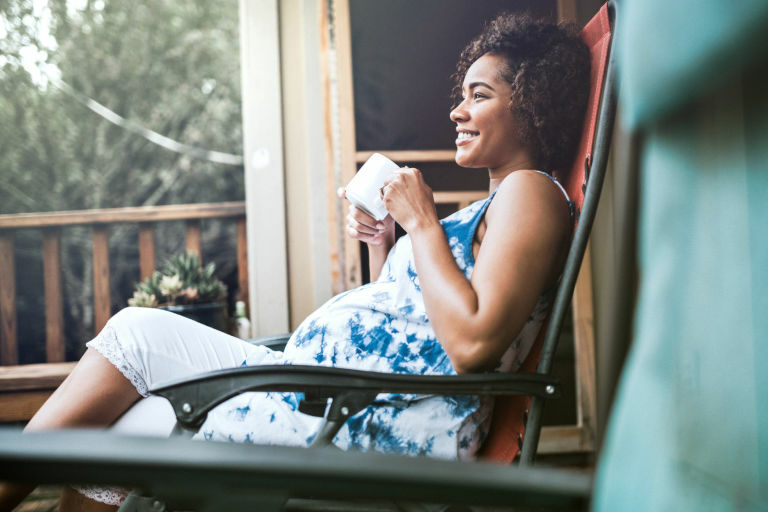 If they’re okay with the fact that they’re going to get pregnant again and have more varicose veins, they just have to be aware that they’re going to have to get them treated again,” Gottlieb says. There’s been a longstanding myth that pregnant women need to steer clear of felines, but your future doesn’t need to involve watching cat videos instead of playing with the real thing. 8. Yes, you can exercise — just don’t go nuts. Sorry, but exercise isn’t prohibited when you’re pregnant — in fact, it’s recommended. But when it comes to you your level of activity, maybe don’t bench press 300 pounds anytime soon. 9. Stressed? It won’t hurt your baby. Many pregnant women fear their high-stress lives are going to affect their babies, but the truth? Stress isn’t good for you, but as long as you’re taking care of yourself, your baby will be taken care of too. “If the mother is really stressed and not emotionally doing well — like not going out, exercising, eating well, and taking good care of themselves — then yes, it can affect the baby. But not if you’re the average type-A person who’s working really hard and has no time for anything. That’s not doing any damage,” Gottlieb says. 10. Postpartum depression doesn’t always show up right after you give birth. …just don’t go crazy. That glass of wine you savor once in a while is totally A-okay. “If alcohol is a concern, they need to cut back and not drink. But if they’re more of a social drinker — going out and having dinner with friends with a glass of wine — I think that’s reasonable,” Gottlieb says.